Rev up metabolism, burn fat, detox, lose weight! The Lipo Shot is recommended to be given once a week. 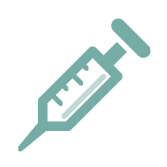 Other than possible injection site irritation, the natural ingredients show no side effects. Exclusive Lipotropic Formula: We use an exclusive lipotropic shot formula manufactured especially for us by an FDA approved supplier and researched for safety and effectiveness. • Vitamin B-12 boosts your energy level. • Common benefits reported include improved sleep, reduced allergies, reduced stress and depression, improved mood, and less frequent or severe headaches. • Vitamin B-12 injections contribute to healthier immune systems and is an essential B vitamin needed to form red blood cells for proper brain and spinal cord function. • Choline detoxifies amines that are the by-products of protein metabolism. • It works with Vitamin E.
• It is used in nerve and muscle disorders such as Multiple Sclerosis and Cerebral Palsy. Caffeine may cause depletion of Inositol. • It works with Choline to detoxify amines which are the by-products of protein metabolism. • It acts as a catalyst for Choline and Inositol, opening up their function. Smart Lipo is one of our most popular procedures! Smart Lipo works best to sculpt and shape a targeted area, typically where diet and exercise has not been successful. It is non-invasive, non-surgical, uses no needles, and does not break the skin in any way. There is no down time or pain and you can return to work right after your procedure.